The Amish Round Hamel Dropleaf Extension Dining Room Table wears the look you need when you need it. Drop leaf style on this solid wood table folds down to save space. 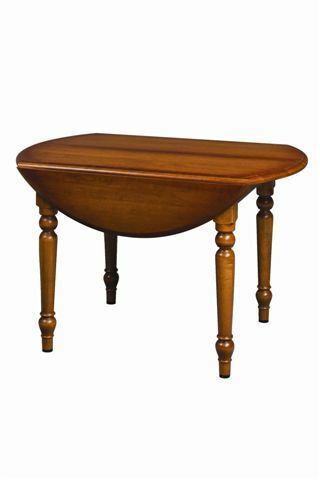 Featuring turned legs and solid wood, this drop leaf table adds a classic look to dining room or kitchen. This solid wood dining table is completely customizable. Have fun selecting the exact options that work for your home. Add up to five table extensions--each extension measures 12"
Custom furniture comes with lots of options. Our Amish Furniture Specialists are happy to walk you through all your options. Email or call us today for personal service with your new dining table. Thank you for visiting DutchCrafters.